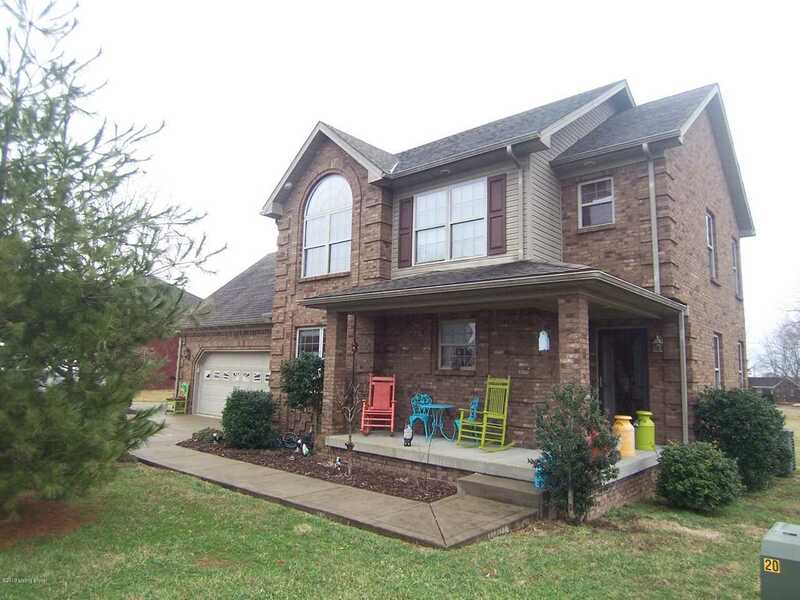 Excellent curb appeal greats you with this great four bedroom two and a half bath brick two story home with two car attached garage located in Miller Springs Subdivision. Covered front porch greets you as you enter into the home. Home features a spacious Living Room & Eat in Kitchen with plenty of nice maple cabinetry and comes equipped with a full compliment of stainless appliances including range/oven, dishwasher,refrigerator and microwave. Eat in Dining area overlooks the back yard. Powder room & Laundry complete the main level of the home. Upstairshouses the Master Bedroom suite that features decorative trey ceiling & nice balcony. Two additional bedrooms and full baths are housed upstairs along with a large bonus room over the garage that is currently used as a 4th Bedroom but could be used as a Family Room or Office. Great rear deck for all your outdoor enjoyment. Excellent commute location to I65 making it easy access to Ft. Knox, Elizabethtown & Louisville. Directions:Hwy 245 to Lutheran Church Rd to Leroy Drive to Ruth Lane to property. SchoolsClick map icons below to view information for schools near 107 Ruth Ln Bardstown, KY 40004. Listing provided courtesy of Area One Realty, LLC. Copyright 2019 Metro Search, Inc. All rights reserved. The data relating to real estate for sale on this web site comes in part from the Internet Data Exchange Program. Real estate listings held by IDX Brokerage firms other than Kentucky Select Properties are marked with the Internet Data Exchange logo or the Internet Data Exchange thumbnail logo and detailed information about them includes the name of the listing IDX Brokers. This information is provided exclusively for personal, non-commercial use and may not be used for any purpose other than to identify prospective properties consumers may be interested in purchasing.